Students rejoice, because your inevitable return to school can now be coupled with the ultimate consolation: a free burrito. 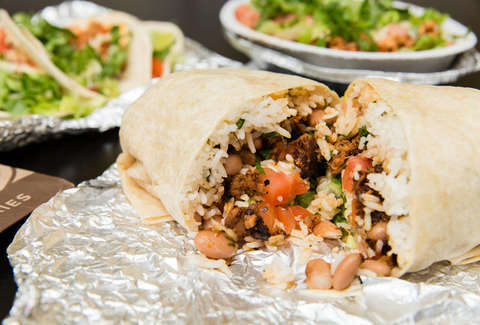 Chipotle is offering another one of its irrefutably good opportunities to eat on the house on Saturday, with a buy one get one free (BOGO) deal, this time directed at America's youth. Last time around, teachers were the lucky recipients. On Saturday, August 18, all students looking to nab free food just have to show proper school ID for in-store purchases, or enter the promo code STUDENT for online orders. There's a lot applicable menu items that fall within the deal's gamut, and according to the company's press release, these offerings include "a free burrito, burrito bowl, salad, order of tacos or a kids meal with the purchase of an entrée of equal or greater value." It's a piece of cake. "Back-to-school season is an exciting time for students of all ages," said Chris Brandt, chief marketing officer at Chipotle. "No matter the time of year, we're committed to providing students -- and all of our customers -- real ingredients, real cooking and real flavor, and we hope this BOGO will only add to students' back-to-school enthusiasm." For online orders, Chipotle made a special website for the occasion, just to streamline the already incredibly easy process of ordering free food. The offer lasts all day, during every outposts' operating hours, so there will be ample time for America's next generation to eat their feelings before heading back to the classroom.